Finding the perfect telephony vendor for your company, much like partnering with any other type of business, is not easy! And when it comes to interviewing telephony vendors, you need to know “enough to be dangerous” about the telephony industry, processes, and technology. Otherwise, how will you know if they can be a quality partner? 1. Not thinking about how the vendor fits into business objectives. What do we plan to get out of this partnership? How can this vendor help us accomplish our goals? 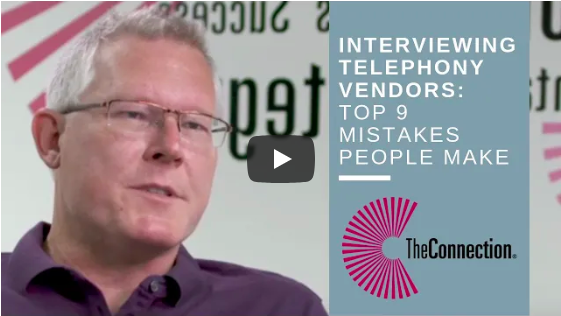 There are many more questions we could ask, but from a 30,000-foot-view, it’s important to know the general direction we want our business to head and how the telephony vendor can help before we interview anyone. 2. Not understanding the technological requirements of a telephony vendor. When telephony vendors join the team, they may have updated technology. So, we should know if taking on a new telephony partner means that we need to upgrade the hardware and software we have now. It is helpful to familiarize ourself with the desktop and network requirements the telephony vendor will need prior to introducing new call center technology to the mix. 3. Not reviewing vendor uptime and how they provide redundancy. If there is an outage, how can the telephony vendor ensure that our business can keep running? Do they have redundant servers and an action plan in case something goes wrong? 4. Failing to look at data security requirements. Will the telephony vendor be handling HIPAA data or cardholder data? Information like that has strict security regulations and should be handled with the utmost care. It's extremely important that they have the right security certifications to protect you and your customers. 5. Not considering the scalability of the vendor’s platform. As our business continues to grow, does the telephony vendor have the capabilities to grow alongside us? Their technology, support, and size need to be able to flex as our staffing requirements grow and change. 6. Not reviewing reporting capabilities. Are you able to report on the KPIs that are important to our business? Will you dig deeper than our expertise in our business and show us unique patterns or interesting data that you have found? Will you translate their findings to us and help interpret the data for actionable business decisions? Do you have staffing to allow for questions we have on your reporting? Will we have constant access to your reporting data? 7. Forgetting to consider organization and culture match. Simply put, will the potential telephony vendor fit in well with our people? Do they have similar goals, culture, training, and perspective? Getting along well with a telephony vendor makes the relationship a lot easier! 8. Not digging into the pricing structure. It’s not uncommon for telephony vendors to build in hidden costs (like network access and integration costs) to their services. We have to make sure that we’ve reviewed how they price all their services before signing any contracts. That way, there are no negative surprises down the road. 9. Failing to review the implementation and support resources. Does the telephony vendor have the infrastructure to start off the relationship quickly and efficiently? Getting the relationship to start on the right foot will be a great help in the long run. When researching telephony vendors, make sure that you consider all 9 of these tips, and continue to find more tips about technology and contact center management from our blog!